Will Albania’s political crisis delay negotiations for accession to the European Union? 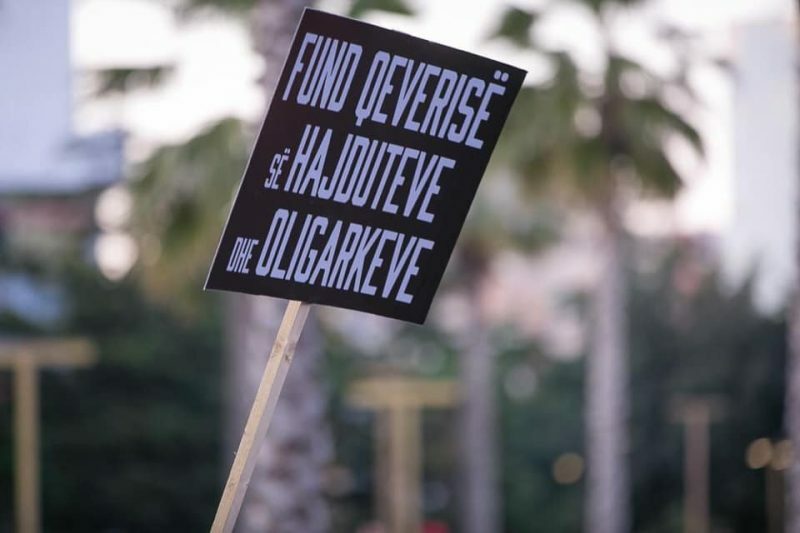 One of the slogans of the Albanian opposition reads: “End to the government of thieves and oligarchs”. Photo by Democratic Party of Albania, for public use. As Albania plods through a now months-long political crisis, citizens are wondering whether the impasse will hinder the EU’s decision to begin talks that could eventually lead to the Balkan country’s accession to the bloc. Since February 2019, 58 out of 62 lawmakers from the opposition Democratic Party and Social Movement for Integration have resigned following revelations by Voice of America and the Balkan Investigative Reporting Network that government officials allegedly collaborated with criminal gangs in a vote-buying scheme in the 2017 elections. As of April 9, 20 new opposition MPs have taken the vacant positions, according to the Central Election Commission, defying the leadership’s call for the boycott. Thousands of people from all over the country have joined the former lawmakers in a series of street protests in the capital, Tirana. They demand that Prime Minister Edi Rama resigns and call for creating a transitional government that will oversee fresh parliamentary elections. Rama so far hasn’t shown signs he’ll resign. At a recent public speech, he said — without addressing the protests directly — that his government will stay in power until 2021, which is when ordinary parliamentary elections are due. The wave of protests has grappled Albania, a NATO member, only months before the European Council is due to announce whether or not it’ll open accession talks. Like some of its Western Balkan neighbors, Albania is an official candidate to join the European Union. The EU requires potential member states to fulfill a set of conditions before they begin the accession process, such as ensuring the stability of institutions, the independence of powers, and a functioning market economy. In the case of Albania, a key condition set by the EU is that it implements a judiciary reform that includes, among other things, vetting of judges. However, it isn’t yet clear whether resolving the political struggle will be one of the conditions to open the accession talks with the EU. Speaking with representatives of the European Parliament’s Committee on Foreign Affairs on April 2, Johannes Hahn, the EU-Commissioner for European Neighborhood and Enlargement Negotiations, has given positive signs that the European Commission will recommend the beginning of talks with Albania. Of the Western Balkans countries, only Serbia and Montenegro have officially begun accession talks with the EU, in 2014 and 2012 respectively. For Serbia, improvement of relations with Kosovo — whose independence Belgrade doesn’t recognize — is on the table. Meanwhile, Albania and North Macedonia are on a path to begin talks. Macedonia made significant strides recently after it changed its name to North Macedonia, resolving a 27-year-old dispute with its NATO and EU member neighbor, Greece. The most recent opposition rally, held in front of the National Assembly on April 3, didn’t cause any disturbance to parliamentary activities. However, the opposition has said it won’t back down until Rama resigns. It’s also unclear whether the Democratic Party will participate in municipal elections scheduled for June 30. The US Deputy Assistant Secretary of State, Matthew Palmer, was in Tirana on April 8-9, where he met PM Rama, opposition leaders, Lulzim Basha and Monika Kryemadhi, and the country’s president, Ilir Meta. He said during a meeting with journalists that he wasn’t there to negotiate a resolution of the political crisis, but he urged the Albanian opposition to attend the local elections, according to a transcript published on US Embassy in Albania’s website. Protests have had supporters coming from all over the country to the capital, while some citizens report disturbances to their routine with frequent street blocks and the occasional firing of tear gas by the police. Some citizens don’t support either the protests or the prime minister, and say that they’re no different from one another. The next rally is scheduled to take place on April 13 in the front of the Prime Minister’s office.